The most beautiful beach in Niteroi, as well as one of the best beaches in Rio de Janeiro state. Praia de Itacoatiara is a paradise with perfect white sand and clear blue waters, hidden between green mountains. A big contrast to a bit dull and shabby Niteroi city center. The area in front of the beach has the most elegant villas and mansions one can imagine. During low season, Itacoatiara reminds of a calm resort town. 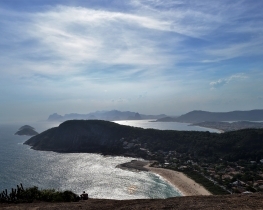 Itacoatiara is also a great place for surfing and bodybuilding, as well as hiking in the surrounding mountains. Itacoatiara beach is in Região Oceânica of Niteroi. It is far, but it is a nice area. It reminds of a small calm beach town, with a few restaurants, beach kiosks and private villas. The beach is confined on both ends with beautiful rock hills, which stretch out into the ocean. Creating a feeling of being in a beautiful oasis. Unfortunately, during weekends with good weather, the beach can become very overcrowded. I´d suggest you to plan for a trekking trip to the closeby hills, which offer some great views and afterwards enjoy the cooling water of the Itacoatiara beach, later have a dinner in one of the local restaurants. It´s a nice daytrip from Rio.